"International Youth Festival - Contest in Circus Art"
Gabor Vosteen is a classical trained recorder player and comedian. His speciality is the playing of five recorders at the same. That's why he is often simply called "the fluteman". His unique combination of music with visual comedy resulted in collaborations in different fields. His latest creation is his solo „The Fluteman Show“. He was awarded with several prizes such as the audience prize Tuttlinger Krähe 2014, 1. Prize at Kleinkunst- und Gauklerpreis Koblenz 2014, audience prize and 2. jury prize Niederstätter SurPrize in Bozen. Gabor performed in shows as Night of the Proms, for Circus Roncalli and in Variety Shows. And as well at venues such as Konzerthaus Wien, Konzerthaus Dortmund, KKL Luzern, Gewandhaus zu Leipzig and TV Shows as „Le plus grand Cabaret du Monde“. "One is constantly busy with laughing that you almost miss to realize what brilliant virtuoso he actually is on this ordinary instrument called recorder." " One has heard mozart's „little night music“ in several variations - but never played on five recorders! That is stupefying, crazy and awe-inspiring." "...The studied musician mixes perfect mastery of the instrument with comedy and physical art. That is without words and makes one speechless. " "With instruments coming out of his mouth and nose simultaneously, he amazed us with perfectly balanced chords and even a section from Mozart’s Eine Kleine Nachtmusik, played both musically and flawlessly"
"I hate the recorder, but that was really cool!" "The flute - for most people the most boring instrument in the world. Till they witness Gabor Vosteen." The craziest concert since the invention of spit. 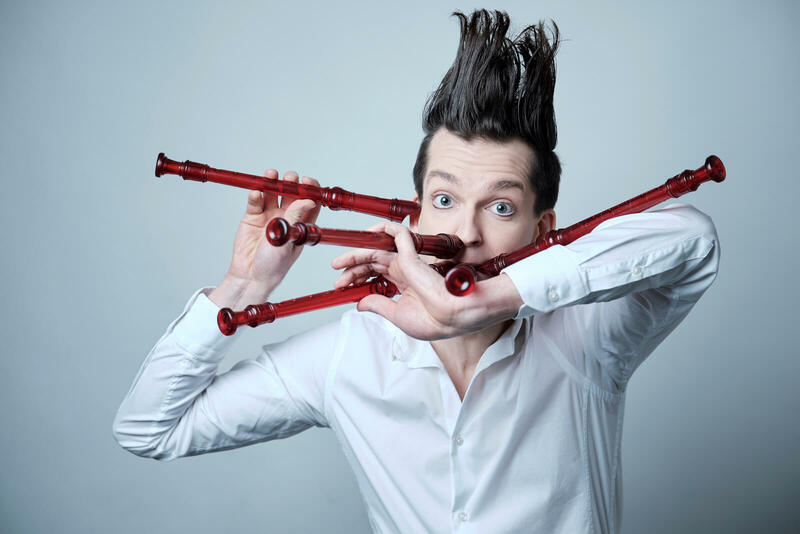 In THE FLUTEMAN SHOW Gabor rises to his vision to save the world with the most considerable instrument of humankind and uses stunning facets of the recorder never heard or seen before. With myriad plastic flutes, a rocky electric-flute, the only leopard-bass flute on earth and countless saucy tricks with the recorder he fulfills his mission: Bach, Paganini, pop-music, own compositions and amazing comedy result into the unheard universe of the master of flutes Gabor Vosteen. A Circus Symphony Südwestdeutsche Philharmonie - Kongresshaus Zürich and KKL Luzern. "It was music aering from another world. His waggish sense of humour turned into commitment and celebration. The audience was delighted." For two years Gabor toured with Circus Roncalli in "Salto Vitale". He was touring as well England with "Giifords Circus" and he performed in the Christmas Circus Hanover. Bringing laughter and music to young people. That was all playback. No human being can play that fast! The Fluteman Show in a adapted version for young audiences. From 30-50 minutes. "Open their heart with humour and touch them with music."